A very popular article on this site has been our piece on one of the worst hotel we've ever stayed in. We said at the time, that we're not here to be a haven of negativity (despite how well the page has trended! ), so with fair and balance in mind, we thought it was time to share some of the great rooms we've been lucky enough to stay in during our years of travelling. Here's the first in a series of articles, we're calling Rooms with a View. This first entry in the series is very easy to recall as it is from our most recent overseas trip, just last month, in April 2018. We were lucky enough to be upgraded from a City View (which we'd snapped up for a steal on Agoda.com) to a Bund View at no extra charge. 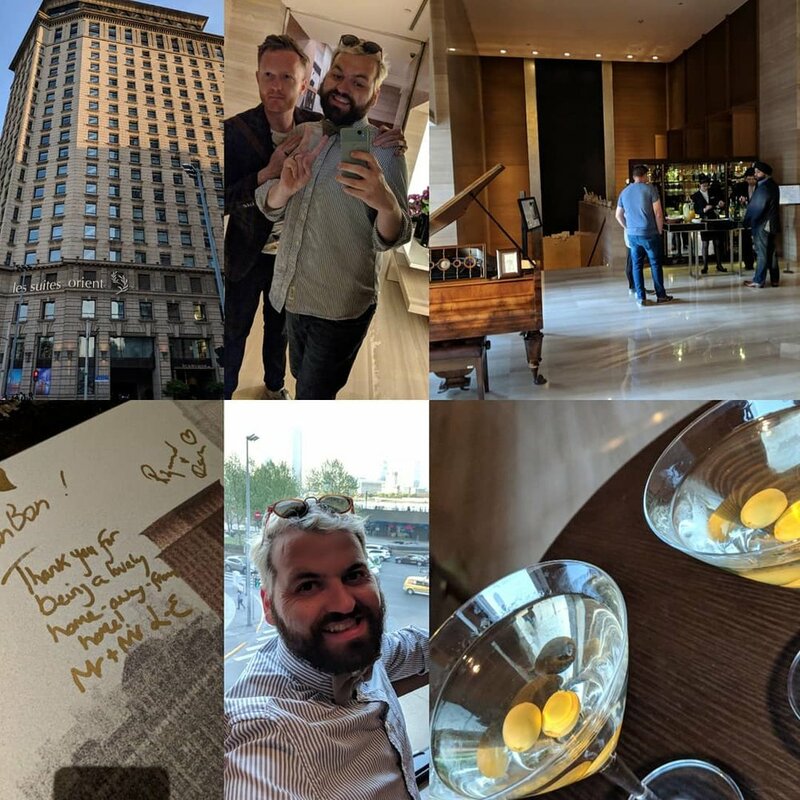 All-in-all, for seven nights, including (the most varied and amazing) breakfasts, our stay at Les Suites Orient, was cost a little over £700 - again, be aware, this was for a city view, which from photographs look lovely. 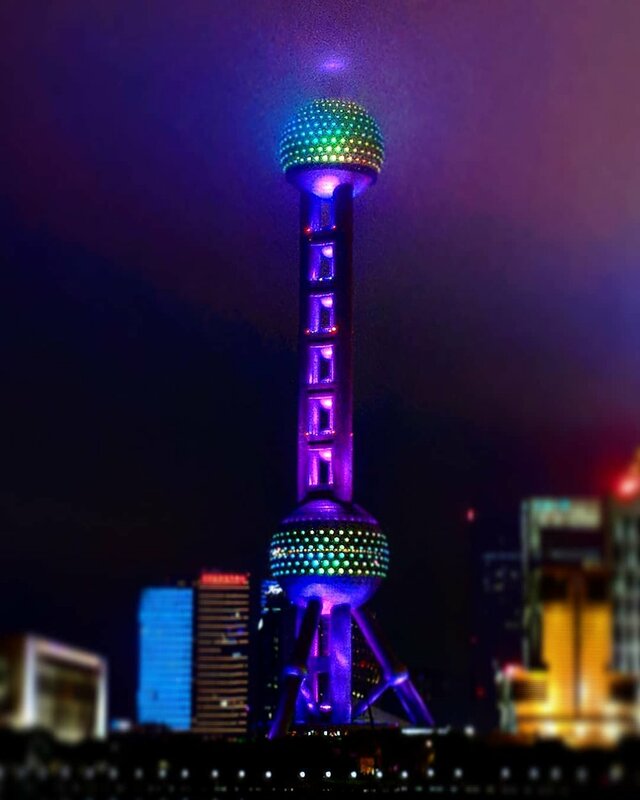 Most City View rooms at Les Suites will mean you'll have a perfect view of the nightly light show on the Oriental Pearl Tower. Hotel bathrooms can sometimes scrimp when it comes to the bathroom, either giving a shower only or combining shower and bath without thinking of the relaxation. Les Suites Orient delivers! The room was very large, well appointed and very clean. Despite being in a major city, we didn't really get disturbed by outside noise either and the hotel is in a great space to explore Shanghai being right on the beginning of the Bund and just across the street from a ferry crossing, meaning before you'll know you'll be strolling amongst the skyscrapers of Pudong. What made this room extremely special (and perhaps our most favourite hotel room ever) was the bathroom, and specifically, the view from the bath. In some way, I even think that Les Suites Orient could rebrand their property as spa as David and I quickly developed a holiday routine during our stay there. 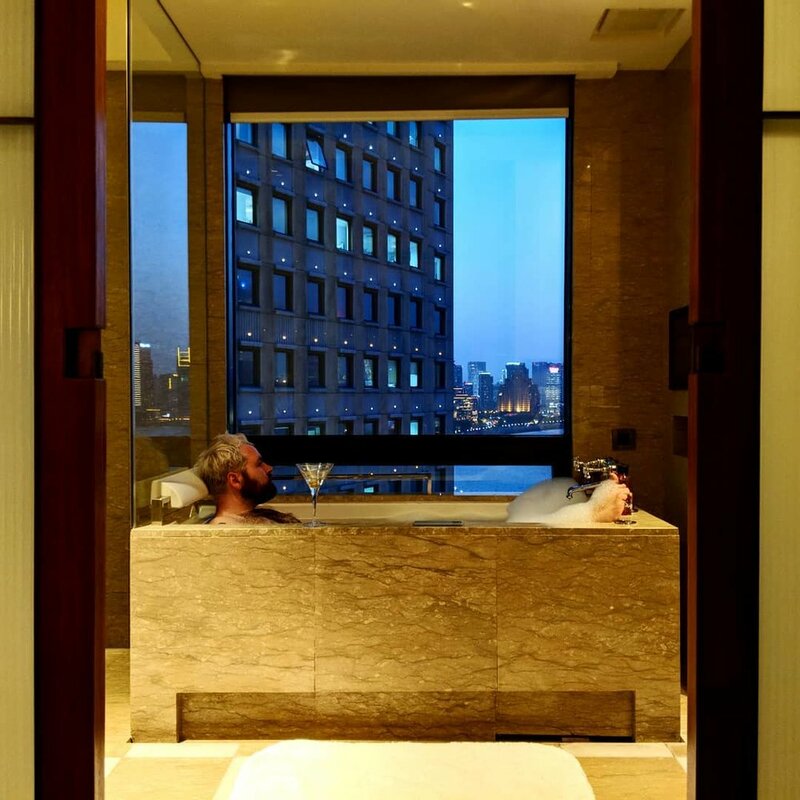 We'd firstly take a dip in the bath and enjoy all of the city lights just before getting ready to go out, and then on our return to the room (a few cocktails later) we'd enjoy another one, this time soaking up the neon from Pudong as well as the bubbles in the tub. The staff at the hotel were friendly, knowledgable and happy to assist in holding luggage, items and organising taxis for you. Check-in and Check-out was very simple and the reception housed lots of interesting historical items including items with document the history of the building and the city. Another great perk at staying at Les Suites Orient is the happy hour that hold each evening in the main reception between 5:30pm - 7:00pm. The hotel doesn't have a main bar, but the elegant reception turns into one between these hours where the front desk team suddenly display their skills in making classic cocktails, free for hotel guests. Throughout the day, if you pop back to the hotel to freshen up or hop onto free wifi, you also were treated to complementary cakes, biscuits and teas and nespresso coffee. As I mentioned, the breakfasts, including in our price, were very good. A great mix of eastern and western and the options changed regularly throughout our seven night stay meaning you never got bored of the offerings. The food was so good and plentiful, we actually found ourselves regularly really only having two meals a day during our week in Shanghai. There's not all these positives without a few negatives; although they are slight. Firstly, our room was a little warm and the climate controls didn't really help (and this was us travelling in April remember). It's worth mentioning here that we didn't ask the hotel to fix and just dealt with it. Les Suites Orient potentially could have fixed this issue. 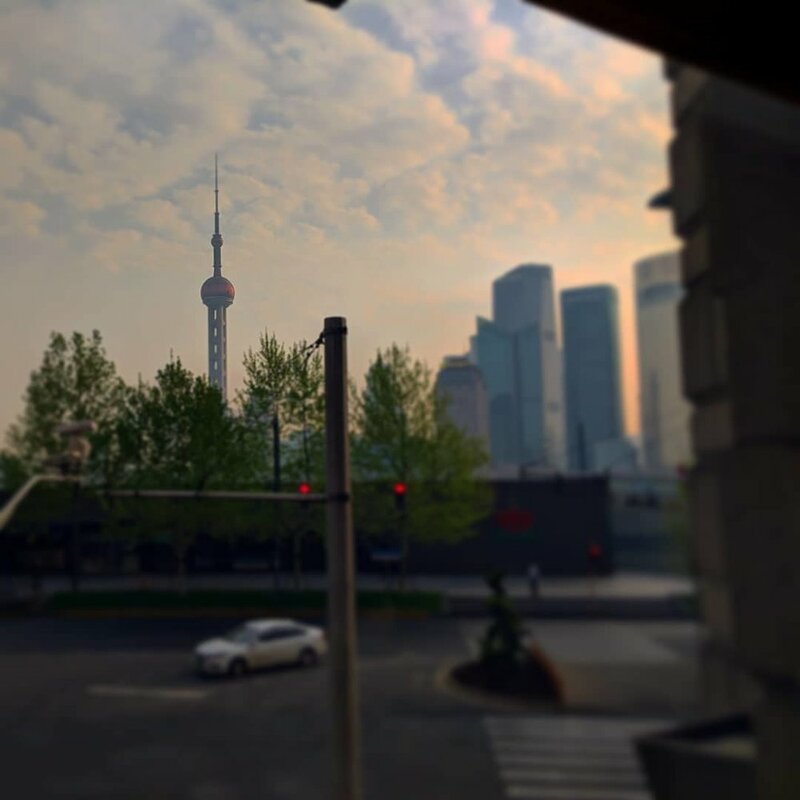 Although close to the ferry to Pudongs and great for trundling along The Bund, this hotel is a good walk from the nearest Shanghai Metro stop. Whilst the hotel is completely accessible, bear this in mind if you're not a fan of, or cannot, walk long distances. Finally, on entrance into the hotel on a few evenings, we did have to walk past a gentleman on the sidewalk who was, how do I put this, letting it be know that he could help us find a lady roommate for the night (dogs barking and trees come to mind!) Even considering his career choice, the gentleman was polite and a firm ''we're not interested" had us sailing past him and into our room. It's just worth mentioning in case you are not a fan of (even very light) conflict. Taking in that spectacular view one last time on our final morning in Shanghai. 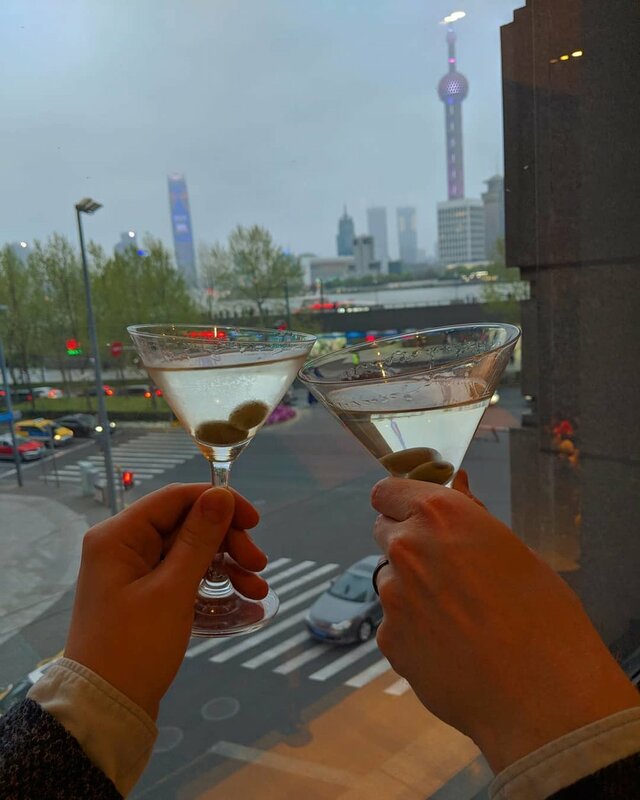 Shanghai was one of the most beautiful and impressive cities both David and I have ever visited. Shanghai Disneyland was spectacular and I'm sure we'll be visiting again soon (we have a two-year visa to get some value out of!) 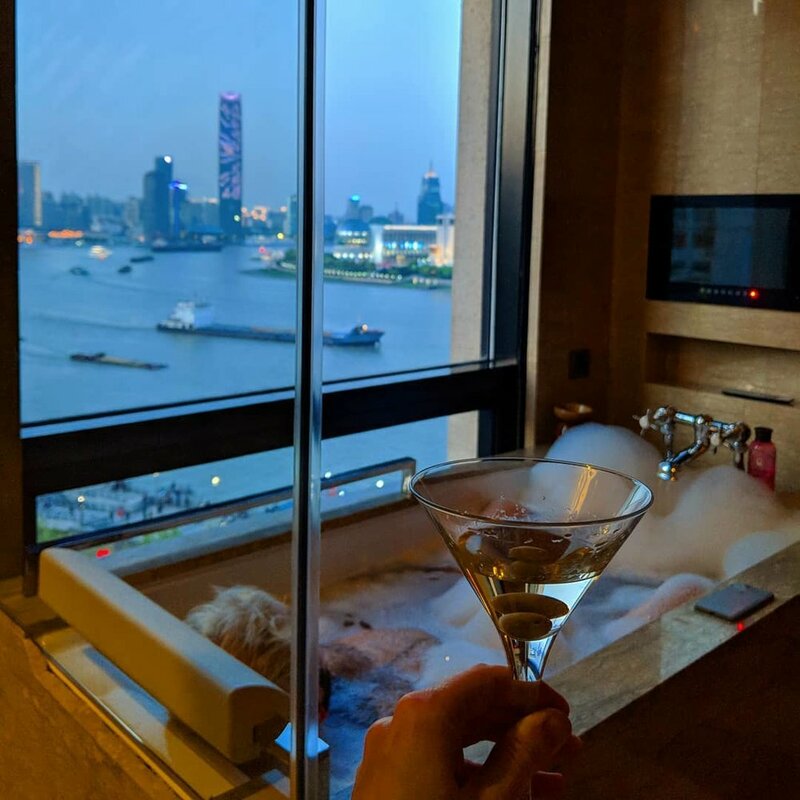 One thing I'm sure of is that when we visit Shanghai again, we'll without a doubt be asking for a Bund View room at Les Suites Orient. Find out more about Les Suites Orient and book your stay by visiting their website. Take me back to Les Suites Orient!